This post might be all over the place, and it’s wrought with emotion and stupid cyclical behavior, but it’s what’s been going on lately, so I’m putting it out there. I’ve always been a disordered eater – a binger with a sweet tooth and little grasp of how to eat “normally.” I KNOW what’s normal and what’s abnormal, but like SOOO many things in my life, knowing what to do and doing it are two different things. Thanks to Jenny, Laura, Layla, and LOST, I crawled out of my little hole and ate dinner, watched “Three Sheets,” and felt a little better. This morning I got up, had my breakfast, did productive things, then went to the park to do C25K (which went well, by the way!). On the way home, I had to stop by Publix to get stuff for dinner, and I decided I’d treat myself to one of their turkey cobb salads for lunch. While I was there, I casually strolled through the bakery to see if they had any single slices of their best-in-the-world key lime pie. I could totally get behind a single slice and feel ok about it. They didn’t have any, but they did have a pack of 2 key lime cheesecake slices. On a whim, I grabbed it and planned to eat both when I got home. Pure old habit, pure comfort, pure sweet tooth. There was a little rationalizing of, “you didn’t eat yesterday! You just ran! It’ll be ok,” but mostly it was “ooh this will taste good and make me happy,” so I quickly stuffed it in my basket and kept shopping. On the car ride home, I thought about it more. Like the proverbial “money burning a hole in your pocket” thing, that cheesecake was boring a hole through my soul. I realized I didn’t *need* to eat both slices and decided I’d wait until after dinner and share one with Mom. I got home, ate my salad, took a shower, and then started obsessing about it. If I had been smart, I would have seen where this whole thing was going and thrown both slices in the lake, but somehow my bass-ackwards rationalization won out, and I sat down on the couch with both slices. I finished the smaller one first and it didn’t taste like I thought it would, plus it was icy in the middle which I hated. I took a couple of bites of the second and said to myself, “you don’t HAVE to finish it, you know.” There was a time in my life (which I’m not 100% certain is over yet) where I would have finished the whole thing just because it was there, but I didn’t today (small victories – woohoo!). I threw the rest away, but the guilt had already begun. 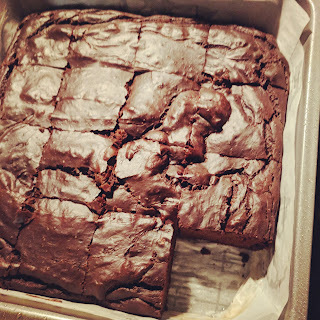 The guilt for buying it in the first place, for not sticking with my plan of sharing (which also made me feel like a greedy glutton), for even attempting to eat both pieces, and a small messed-up part of me felt guilty for making up for part of the deficit I created yesterday. How’s that for disordered? I don’t even know what question to close with; I just wanted to get this all down and be honest. I know these things to be true: 1) I shouldn’t have bought it in the first place since it wasn’t even what I was looking for, 2) I should’ve done something else to comfort me instead of eating something it, and 3) I shouldn’t give power to food. Great. Let’s hope I do all those things next time. Any experiences you can share or advice you can give besides that is definitely welcome!